XoristDecryptor is a lightweight security tool developed by Kaspersky that can reliably detect and remove infections associated with the Tronjan-Ransom.Win32.Xorist agent. Since the program is portable you can simply run the downloaded executable file from your hard drive or a removable storage device. In the plain interface you can click on the dedicated button to start the scan process. 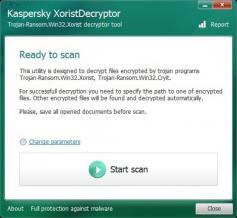 However, XoristDecryptor offers a few scan customization such as the target drives and the option to delete crypted files after decryption. The results display the scan duration, detected threats, total number of processed items and the decrypted files.